Kai Blackdragoon - Seemingly might hate with strange passion. Ryouga is a well-spoken and normally polite teen, holding a high sense of honour and loyalty to those he sees. Still, he can become quite headstrong and has a nasty habit of charging straight into things like a berserker. This also sides with his duelling style, suiting to ram and put pressure on his opponent with raw destructive power. 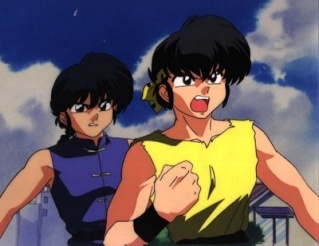 Ryouga, though holding no seemingly special abilites, is quite a good fighter in hand to hand combat, and is known to be martial artist that relies on raw strength. At times it seems that his strength borderlines on near-superhuman lengths, and he takes advantage of this by possessing an umbrella that is far too heavy for normal people to even hold. Duel Disk - Style: A seemingly normal duel disk, yet it seems far to heavy for a normal person to even attach to their arm.